The 40th General Committee Meeting of the Turkish Association of Automotive Parts & Components Manufacturers (TAYSAD) was held by participation of Faruk Ozlu, Minister of Science, Industry and Technology and Huseyin Aksoy, Governor of Kocaeli. Delivering keynote speech of the General Meeting, Alper Kanca, head of TAYSAD, specified that they had exceeded the number of 400 members targeted for the 40th anniversary, and added they accomplished one of their targets by reaching the number of 404 members in the 40th anniversary. 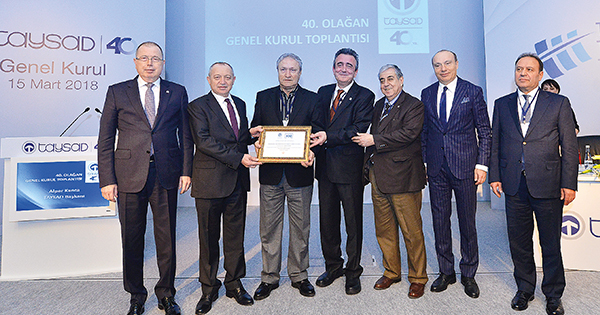 The successful members were awarded in the 40th anniversary of TAYSAD. The awards of the firms – which exported much, joined the education programs that were held by TAYSAD and supported social responsibility projects – were presented by the Minister Ozlu and Governor Aksoy. In the exports as Bosch, Maxion Inci Jant and Valeo took place at first three, in education category Kirpart topped, Assan Hanil and Ma-Pa Machinery second, Presmetal ranked third. As for the firms granted much to ADMOG project were Asaş Aluminum, Ford, Tezmaksan and Barsan Logistic.